Where are you on your scholarship journey? 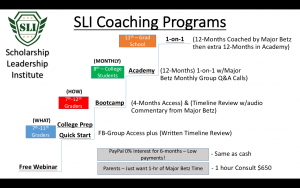 FOUR MAIN SLI PROGRAMS YOU CAN START TODAY! What makes SLI special? Click here to watch the 2-min video and prepare to be amazed! There are rules to searching for scholarships! We teach these rules and so much more in our three premier coaching programs! Our 1-on-1 (PREP) coaching program has truly changed lives by helping some teens earn 6- and 7-figures! We even have 11-yr olds who have earned $60,000 in scholarships! Our SLI Monthly Scholarship Membership“ is a game-changer! Major Betz has uberized his 1-on-1 coaching program for families who don’t specifically need the 1-on-1 help from Major Betz, his counselors and his essay reviewers! This year we heard you and developed a “College-Prep Quickstart Program” that will teach you WHAT you your student need to do to get into college plus so much more (NOTE: This course is not focused on scholarships like the other 3 premier courses b/c some of you don’t need that yet)! Remember, when making an investment into an SLI Coaching Program it is best to know your expected Return on Investment (ROI) in order to determine if our programs are worth the investment! Our “3-hr Ultimate Scholarship Bootcamp” has been our most powerful economical program! It is an immersion of all the things your student needs to know and do to begin earning scholarships! If you don’t know where to start, I recommend the Bootcamp! The Bootcamp is easy to do live all over America! We are going to have you fill out an SLI Needs Assessment that will help us identify your teen. But the chart below can help you make a guesstimate as to whether your student is one, or a combination, of the following SLI scholarship Avatars before you look into enrolling them into one of the 4 SLI Programs or into one of our less intense programs. 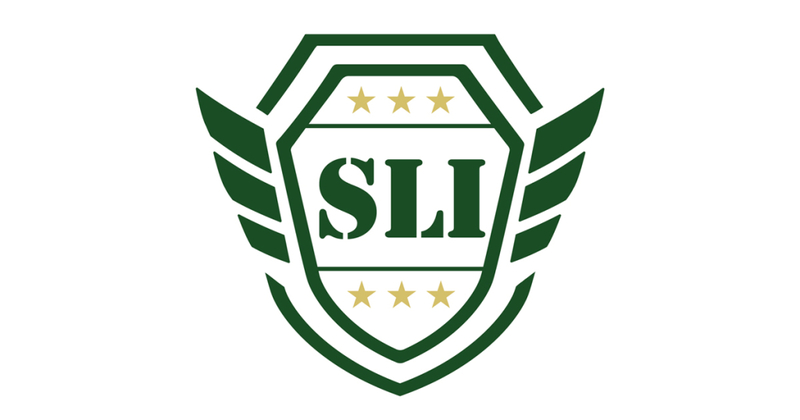 Make sure you check out our SLI Program videos to get all your questions answered about the coaching programs. The cost of our programs, including new 0% PayPal payment plans, is more affordable than ever before so check out our life-changing courses! Wanderer Symptom – A wanderer is a teen who may be a little immature for their age and don’t really have the focus of go-getter teens in their age group. Some could even call them apathetic when it comes to preparing for college. They don’t seem motivated and parents have to stay on them to make them see how important their education is to their future. 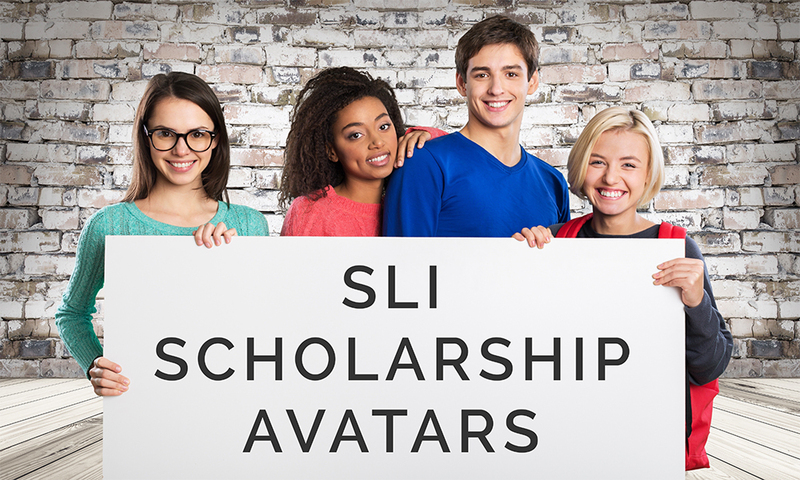 SLI will help the wanderer gain better focus on the opportunity and not the obstacles they face, so they can begin the process of being ready to apply for and acquire scholarships. Many of them will find a cure in the 3-hour SLI Ultimate Scholarship Bootcamp or our comprehensive SLI Monthly Scholarship Membership. If they are younger, the monthly subscription program might be their best prescription until they are ready for the work required in our other coaching programs! Scrambler Symptom – A scrambler is a teen who does understand the importance of preparing for college and is willing to do the work, but they are all over the place! They usually are behind the scholarship search curve and are trying to make up for not doing the basics we focus on in our coaching programs. They also tend to be very busy, so we have to help them get focused before we convert them to High-Achievers and Earners! SLI prescribes the 3-hour SLI Ultimate Scholarship Bootcamp or our comprehensive SLI Monthly Scholarship Membership if they are able to follow instructions and get focused with the right guidance! If they are younger, the monthly subscription program might be their best prescription. However, if they are EXTREMELY coachable 11th graders or higher AND willing to put in massive work we would consider prescribing the PREP 1-on-1 program! Enrollment is extremely selective! High-Achievers Symptom – High-Achievers are teens that are actively involved in youth groups, competitive athletics, extra-curricula activity, etc., or a combination of them. They can also be scramblers due to their hectic schedules, but they are very coachable. We often have to convince them to prioritize the big rocks in their life in order to make time for scholarship search. BUT when they get focused, LOOK OUT! They can then become the SLI earners that have the ability to make 7-figures in scholarships! While we believe they will benefit SLI’s 3-hour Ultimate Scholarship Bootcamp or our comprehensive SLI Monthly Scholarship Membership, if they had the funding, we would prescribe the Prep 1-on-1 Coaching program, which is selective! The family and student would really have to understand the concept of Return of Investment (ROI). If they really want 6-7 figures, they will benefit from enrolling in one of our programs ASAP! Earner Symptom – The earner is the teen who has already begun the process of “applying for and acquiring scholarships.” They now need help multiplying their successful mindset and practices so they can continue to focus on the opportunity and not the obstacles of scholarship search! The earner should acquire meaningful scholarships if they do what we teach in the SLI program. Our goal is to have every teen in our program become high-achievers and earners, however that isn’t realistic. Some will slip through the cracks, but that will depend on the partnership between, SLI, the parent, and the teen! We believe they would easily benefit from SLI’s 3-hour Ultimate Scholarship Bootcamp or our comprehensive SLI Monthly Scholarship Membership. However, we would HIGHLY prescribe the Prep 1-on-1 Coaching program, which is very selective, but designed for those with the High Achieving and Earner symptoms! The family and student would really have to understand the concept of Return of Investment (ROI). If they really want 6-7 figures, they will benefit from enrolling in our SLI Monthly Scholarship Membership or 1-on-1 Prep ASAP! You are the parent of a middle school student who is in need of guidance when it comes to preparing for college and best positioning themselves for scholarships. We have two GREAT programs for Middle School students. If they are READY TO APPLY FOR SCHOLARSHIPS The Ultimate Scholarship Bootcamp (USB) is the course you want them enrolled in ASAP! Click here to see the video for the Ultimate Scholarship Bootcamp! What would it be worth to have America’s #1 college strategist teaching your students what they need to do and how to graduate college debt-free, starting as early as 6th grade? Major Betz has helped teens earn millions of $$$’s for college. Now he has created a short course that includes everything you need to prep your student AND help them pay for college! The Ultimate Scholarship Bootcamp was specially designed for 7th – 12th grade students who NEED help prepping for college, but aren’t ready OR able to enroll in the full-paid (or monthly) SLI Monthly Membership service. They also aren’t ready yet for the competitive 1-on-1 Prep Coaching Program. College students would still benefit from this program or the Monthly Membership. The College Prep QuickStart was designed to help students best position themselves to get into college and be more competitive when it comes to earning scholarships later on. All 4 programs are amazing! 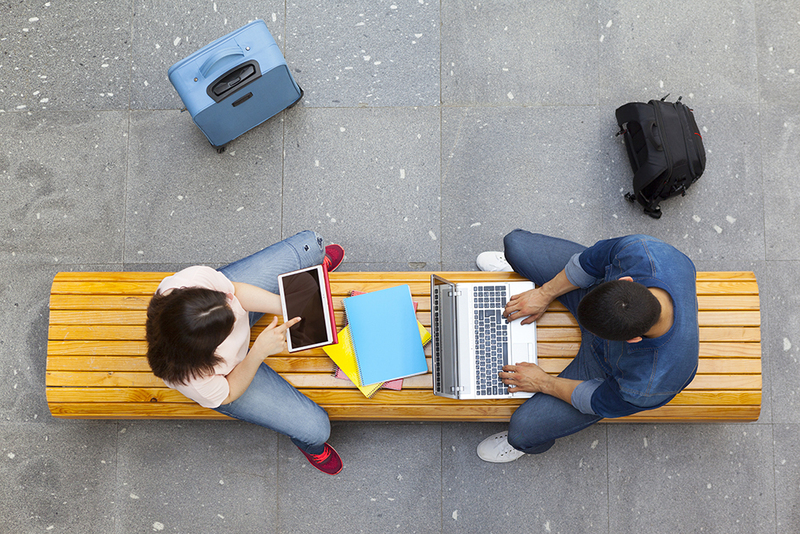 Your student’s maturity level should drive your decision-making when it comes to selecting a course. Remember, our PayPal 0% Interest offer is for 6-months, if the product cost is $99 or higher, so you truly can start with $0 today! Why let Major Betz be your mentor? There are rules to paying for college. Unfortunately too many families are clueless and don’t know what to do to help their deserving students get into and pay for college. At SLI, we have helped 1,000’s earn scholarships, over 150 earn overpayments, 2 earn over $1,000,000, and one 11-year old earn well over $60,000. Why did we create this Ultimate Scholarship Bootcamp? To help those who can’t afford the concierge services provided in our 1-on-1 Prep or the group class provided by our SLI Monthly Scholarship Membership. If this course is more in-depth and immersive than you need right now, we encourage you to join our SLI Monthly Membership Course, especially for those who can follow directions on “WHAT TO DO” and “HOW TO DO IT”. It was designed for 7th thru 12th graders who are not earners yet, but 12-graders early in the school year can truly benefit from this program too! We are REALLY good at what we do! We have helped teens earn over $40,000,000, but that doesn’t matter. If we can find teachable parents who are willing to do what we teach, they can earn scholarships! If they do it effectively, they can earn a full-ride! We are sick and tired of having students show up in the Spring of their Senior Year or as College students looking for our help. They need to start earlier to enhance their chances of winning meaningful scholarships. While the Bootcamp will help students get on track, aggressive 11th graders and up may need more. SLI’s 1-on-1 coaching program is where students experience the most success, followed by the SLI Monthly Scholarship Membership! But the Monthly Membership and the Bootcamp programs can both help anyone from 7th grade through college students better prepare for college. Don’t sit by and do nothing! Winter is coming! Click Here To Learn More or Get Started in The Monthly Membership TODAY! Click here to learn more about our Ultimate Scholarship Bootcamp! You are parents of a HS student who probably doesn’t always listen to you, but they are coachable. You either don’t need or can’t afford our 1-on-1 Prep coaching program. All you need is guidance on what to do to start applying for and winning scholarships. If you had that information, you and your teen could work well on your own with minimal supervision when it comes to applying for scholarships! 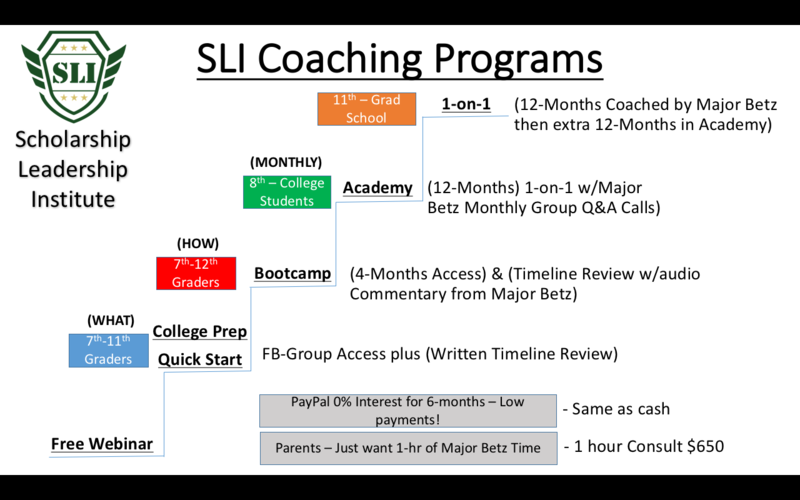 The SLI Monthly Scholarship Membership is going to be our most popular and affordable coaching program. Students will walk through a DO IT YOURSELF duplicatable process (INCLUDES 12-LIVE Q&A Sessions) by which they can learn to get into and pay for college! While it isn’t the same level of detail experienced by our premier 1-on-1 coaching program clients who are seeking an exponential chance to earn 6- or 7-figures, it definitely hits the mark with the family that just needs to be pointed in the right direction! Major Betz does this and so much more in this online version of the wildly successful EmPowerment 21 (EP21) (Major Betz’-led non-profit) that he started back in 2005. This 12-month program is for the family who just needs to know what to do! If they are told what they need to do to get scholarships, they have the time and ability to do just that; earn a lot of scholarship money! We want to help them do just that! Enroll in a course that will change your teen’s financial future as you go through your workbook full of duplicatable success principles! Remember, our PayPal 0% Interest offer is for 6-months, if the product cost is $99 or higher, so you truly can start with $0 today! Prepare to be amazed! Click here to see a video explanation of this program! What will you get in the SLI Monthly Scholarship Membership? You know your teen deserves scholarships, but you don’t know what you don’t know when it comes to navigating the scholarship minefield. Other students seem to be earning scholarships even when you know your student is just as qualified! You also have heard of others who were smarter than your student and yet they still didn’t earn scholarships, so that concerns you. You want to be able to do more to help your student prepare but your scholarship search information may be dated. What You Need Most to Achieve Your Desired Outcome? Like those who are considering our 1-on-1 Coaching Program, you want a proven someone or an organization focused on teaching scholarship/leadership tenets that will help your student. This help will in turn help reduce your stress, confusion, debt-concerns, and/or frustration when it comes to preparing for the scholarship readiness journey. You want someone to help alleviate your concern about waiting too late to get started. You are also concerned about having to settle for attendance at a Junior College without giving your student a shot at attending a 4-yr institution. Why the SLI Monthly Scholarship Membership is Where You Belong? In the SLI Monthly Scholarship Membership your student will enjoy the benefits of a self-paced course, while also being a part of an organization thru our periodic Q&A calls that will give them a leg up usually enjoyed by students who are a part of expensive youth groups, competitive travel sports teams, etc. If they already are a part of one or more of these organizations, they will exponentially increase their chance of scholarship success by joining the Scholarship Leadership Institute (SLI). So change the trajectory of your student’s educational success similar to the benefits of a successful investment portfolio. Enrollment in our SLI Monthly Scholarship Membership program enables parents to relax as they are empowered with a roadmap for their student to become an SLI scholarship High-Achiever and Earner! You are parents of a 12th grader or a college students (maybe even a very smart 11th grader) who really need success winning scholarships in the near future. You are concerned about your shortfall when it comes to covering the cost of their college attendance, especially to the school of their choice! You want to ensure your student’s current scholarship activity will be enough to pay for their college education and debt-elimination for the rest of their lives! Click here to see a video explanation of this program! You know your student is not where he needs to be in the areas of being prepared for the scholarship search process. There are 11-year olds out there who already have earned $60,000+ in scholarships and your student hasn’t even started yet! Your student’s essay writing, speaking ability, interview skills, SAT/ACT preparation, etc. all could stand some improvement and their leadership skills may not be where you would want them. You may have a student who is a wanderer/scrambler, who desperately needs guidance when it comes to gaining more focus on her college desires, dreams and goals. You really are waiting for someone or something to help you and your student work better to prepare for the scholarship search process. You are concerned that you guys may see some light at the end of the tunnel, but you want to ensure it’s not a train! You understand that your student will need to develop the habits it will take to be consistent and disciplined in their scholarship search process. So you want to see some tangible evidence that your student is on track. You have heard of others who were smarter than your student and yet they still didn’t earn scholarships, so that concerns you. You want to be able to do more to help your student prepare but your scholarship search information may be dated. You want a proven someone or an organization focused on teaching scholarship/leadership tenets that will help your student. This help will in turn help reduce your stress, confusion, debt-concerns, and/or frustration when it comes to preparing for the scholarship readiness journey. You want someone to help alleviate your concern about waiting too late to get started. You are also concerned about having to settle for attendance at a Junior College without giving your student a shot at attending a 4-yr institution or the school of their choice. Why Prep is Where You Belong? In Prep your student will enjoy the benefits of being a part of an organization that will give them a leg up usually enjoyed by students who are a part of expensive youth groups, competitive travel sports teams, etc. If they already are a part of one or more of these organizations, they will exponentially increase their chance of scholarship success by joining the Scholarship Leadership Institute (SLI). So change the trajectory of your student’s educational success similar to the benefits of a successful investment portfolio. Enrollment in our SLI Prep program enables parents to relax as their student works to become an SLI scholarship High-Achiever and Earner! “COACHING” MODULE (12-Months) – Start Today!!! Maj Betz & his team personally works with teens as if they were his own kids! PRICE: Contact Major Betz for details on the prices and how to enroll. If you enroll in our SLI PREP Program, you won’t have to pay for many other SLI services AND you will be automatically enrolled in the Scholarship Academy for 12-month AFTER you complete the Prep 1-on-1 Coaching program! You will receive invites to select webinars/teleseminars and an email soon giving you an opportunity to speak with Major Betz personally, if you so desire. Then you can determine if this program is right for you or your teen. We have a big year ahead of us and we hope you will consider becoming a part of our brand new Scholarship Leadership Institute (SLI) family! As a new subscriber to our community, you will continue to receive invaluable information monthly about our incredible Scholarship Success Program! You can unsubscribe at any time at the bottom of any email you receive. You will also get a chance to win free prizes (books, coaching sessions, etc.) and earn deep discounts on our ever-growing products and services! The change you seek is seeking you! We will be in touch within 72 business hours! • Will Nippy actually work with my teens? Yes. There will be others working with Nippy to help the teens reach their dreams and goals. • Is My Credit Card Safe? Yes. We use s/w that won’t allow us to see your full credit card #, so know that your info won’t be disclosed by my team. • Can I Cancel Anytime? Yes. When/if you decide to cancel, just call us or send us an email. We will cancel your account on the day you notify us. • When Will I Be Billed? Immediately for your initial payment. Then we will bill you monthly (option #1 beginning on Sep 1st) or bi-montly (option#2 beginning two months after your downpayment) thereafter until you cancel or have paid what is due. • Can you guarantee a teen will earn scholarships? No. But our success is well documented. Nobody will work harder to help your teen earn $ than S4A!